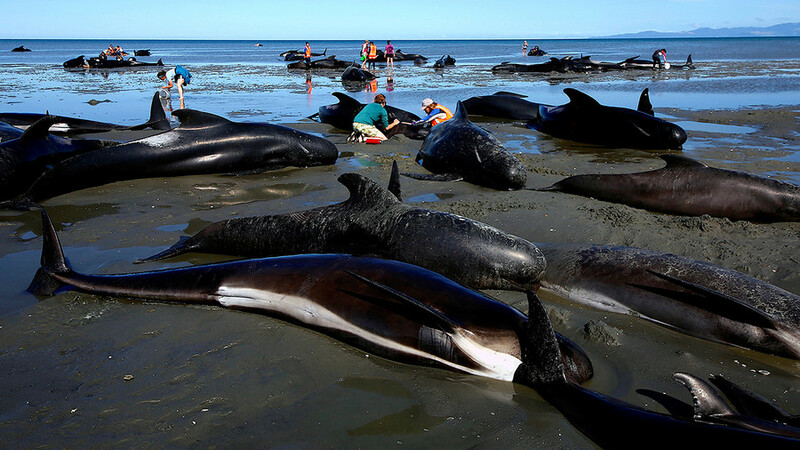 Rescue workers managed to free at least 80 pilot whales that were recently stranded on a New Zealand shore in a deadly mass beaching. However, the life-saving operation has been further complicated by another 200 that have washed up on the shore. Some 415 pilot whales washed up on Farewell Spit near the settlement of Puponga on the northern coast of New Zealand’s South Island on Thursday night. By Friday morning, some 300 of the mammals, which can each up to six meters in length, had died before rescuers could reach them. Since early Friday, hundreds of volunteers have joined the rescue operation led by the New Zealand Department of Conservation (DOC), doing everything in their power to keep the remaining 100 alive. According to DOC, 80 of the 100 whales were refloated on Saturday morning. “Currently they are offshore 6 km further up the spit. They are being monitored by boat for the next two hours as the tide goes out,” the DOC statement said. The remaining 20 “are not in good condition and will be euthanized to relieve their suffering,” DOC added. “Unsuccessful attempts at refloating the whales would likely lead to more injury and stress to them and prolong the whales’ suffering. DOC has taken the decision to humanely euthanize the whales out of concern for their welfare,” the statement said. The rescuers now face another challenge, however – 200 more whales have been stranded nearby. Both DOC and Project Jonah, a group that helps rescue marine mammals, have called for volunteers. Project Jonah coordinator Mark Rigby can’t explain the mass whale stranding. “All we know is it keeps happening. There will be people who will argue that it’s natural. We’re here for the welfare of the animals,” he said. Since 1840, more than 5,000 whales and dolphins washed up around the New Zealand coast, making it a main “hotspot” for marine mammal stranding, according to DOC data. The current stranding is the third largest in the recorded history of such events in New Zealand. The biggest, which saw around a thousand sea creatures beached on the Chatham Islands, occurred in 1918. Heartfelt condolences & gratitude to the NZ whale rescue folks at @ProjectJonah and @wildsidenz. Farewell Spit is notorious for being a trap for the mammals. In February of 2015, about 190 whales were stranded on the beach there. Pilot whales are highly social creatures that inhabit oceans almost worldwide. They are also among the whales most frequently found stranded in groups.